Can Ethiopian Children be the future guardians of their heritage? Home / Art / Can Ethiopian Children be the future guardians of their heritage? The scene is reminiscent of the famous museum scene in the Movie ‘Black Panther’. It’s April 14th, and we are in London at the Victoria and Albert Museum. An Ethiopian man presses his hands against a protective glass to see the treasures looted from his country 150 years ago – almost to the day. He is not alone. He came with his wife and children to see the 22 pieces of historical treasure exhibited to commemorate the anniversary of the battle of Maqdala located in current day Ethiopia. 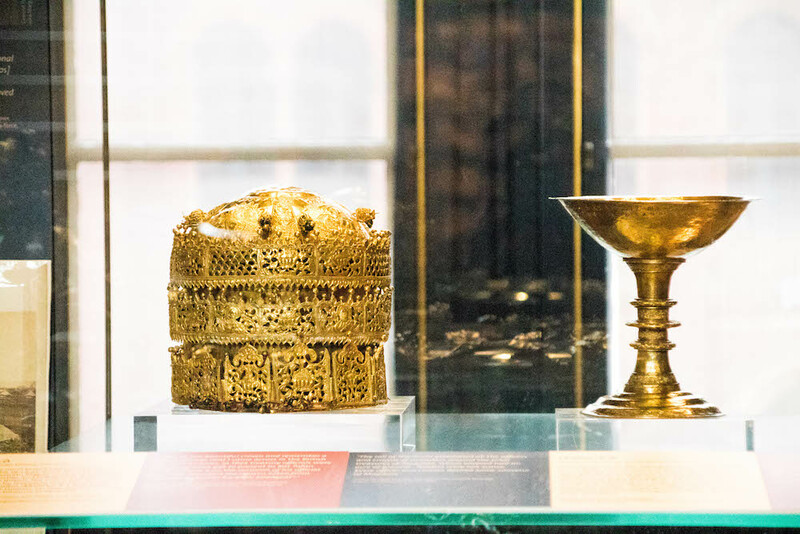 The center of the display featured some of the most prized treasures that were looted: An “18-carat, three-tiered crown and a golden chalice”. The crown is a magnificent testament to the craftsmanship of the Abyssinians. Symbols and images of the apostles and saints are masterfully embossed across each tier. It is a sight to behold and must have been among the most prized possession of the defeated Emperor Tewodros. The man’s young son, keenly aware of the origin of the treasure and oblivious to the intricacies of laws, and diplomatic procedures went straight to the point. Can we take the crown? If only things were that simple. I watched this young boy as he eagerly took pictures while continuing to question why he couldn’t simply take these treasures away. The complicated answer to his simple question is that he inhabits a world set up in a way, that as an Ethiopian or a child of Ethiopian heritage, London was the place for him to see part of his cultural heritage. You may think that it is not such a big deal. 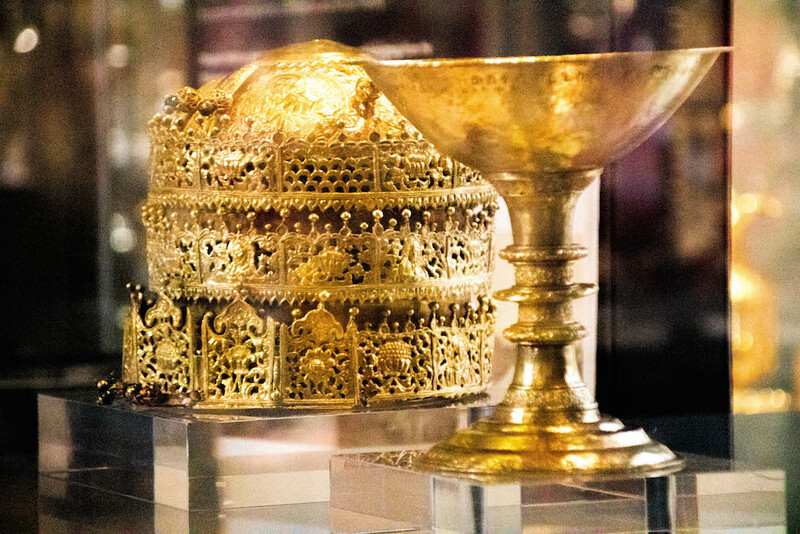 After all, it is merely a matter of 20 artifacts – Notwithstanding the golden crown and the chalice – whose absence doesn’t make a big difference to the daily lives of the estimated 107 million Ethiopians. However to understand the scope and the impact of what has been taken away, we need to go back in time to Maqdala before the fateful battle. Emperor Tewodros was a well-read monarch who is still revered in Ethiopia for being a visionary ruler, intending to modernise Abyssinia – the name of the region at a time. He came to power in 1855 and sought to unify his rivals’ smaller fiefdoms under his centralised Empire. He never achieved that objective as he was constantly away attempting to quash a rebellion. As part of his grand vision of a unified nation, he had planned to build in Maqdala, a church and a learning center. It would have been a place for these deeply Christian communities, to see, read and study the beautifully illustrated prayer books, and manuscripts – some of which were written on goatskin parchment. He had assembled there, what scholars estimated to be over 1,000 books, prayer books, and old documents taken from churches and other cities he had conquered over the years. In 1857, he sent a letter to Queen Victoria requesting military assistance as a fellow Christian, against his many regional rivals. With no response from the Queen, who never received the letter, he took the British consuls and other Europeans hostages in 1864. After multiple failed attempts to negotiate the liberation of the captives, Britain mounted a punitive expedition in 1867. In April 1968, General Nappier’s 13,000 strong forces armed with the latest modern guns faced Emperor Tewodros’ few thousand men armed with spears, swords and old weapons. The outcome was predictable and bloody. The prisoners were released unharmed, and on April 13, the Emperor committed suicide instead of being taken prisoner. In the following days, the British and Indian troops looted Maqdala and reduced it to ashes. At the subsequent auction held on April 20th and 21st 1868, Mr. Holmes, a representative of the British Museum who travelled with the expedition, acquired about 360 books and manuscripts. These manuscripts held a great religious value for the people of Abyssinia and shed light on their religious practices and culture. General Nappier later wrote, “No booty was found at Magdala.” However, the British troops needed no less than 15 elephants and 200 mules to move the books and all the treasures they looted. Nappier’s troops redistributed some manuscripts and books to some local churches in the area. But overall, an estimated 50% of the contents of Emperor Tewodros’ library were removed and are now spread in various collections all over Europe (including in France, Germany, and Ireland) with the majority at the British Library. (They were transferred from the British Museum to the British Library). 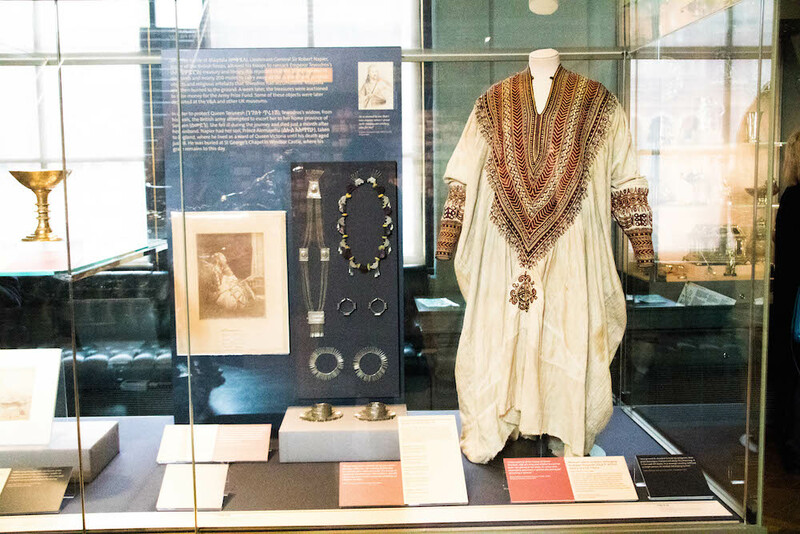 Other treasures including, clothing and jewellery similar to that which the V&A has in its possession are dispersed across various collections and museums. The list has been painstakingly assembled by Afromet, an organisation that has been tirelessly campaigning for the return of the Ethiopian heritage. While the exhibition has the benefit of bringing this restitution campaign back to the fore, it is the broader overview of what was looted at Maqdala, and lost and gained, depending on which side you are, that is critically missing. It has to some extend, trivialised the selected items put on display. War and cultural looting have long been bedfellows. History books abound with examples of looting. They have been used as a tool to further humiliate losers of wars and assert not only the victors’ military superiority but also their moral and cultural dominance. A concerted international effort to protect cultural heritage in war zones and restrict their illegal trade is relatively recent and dates back to the Hague convention in 1954. However, even in these times of systemic war combined with looting , Maqdala’s clear out was appalling. Mr. William Gladstone then, British Prime Minister “deeply regretted that these articles were ever brought from Abyssinia and could not conceive why they were so brought”. That question could be extended to the treatment of Prince Alemayehu, Emperor Tewodros son. The exhibition has reopened old wounds and renewed calls for both the Prince’s remains and the cultural properties to be returned to Ethiopia. It echoes the restitution debate raging in France with a significant difference: in the UK, only the V&A Director has officially expressed his opinion in favor of restitution in the shape of a long-term loan. Such a solution, while it marks a progress compared with previous official rejections, is problematic because by nature, a loan entails a return of the items. In addition, the long-term loan, (should all parties consent to it), would be extremely partial. It is fair to assume, it would cover only the V&A collection, which is a small proportion of all the treasures taken from Magdala. It would be a one-time solution that fails to address the broader issue of how to deal with the treasures and cultural properties of dubious origins that are kept in museums across the country, especially at the British Museum. That single option would also leave out the restitution requests made by other African countries such as Egypt and Nigeria, that have been campaigning for the return of their own properties: the Rosetta stone, and the Benin Bronze to name just these two. The British Museum Act 1963, tightened up the rules and revokes Museum Trustees’ authority in dealing with restitution claims. So most likely, only a national debate and an act of parliament could trigger a nationwide change. I am doubtful that as a country, the United Kingdom is ready to engage in such debate as it would require an examination of its past as a nation with an empire. The country’s satisfaction with the status quo denotes, somehow, a widespread and a continuous eurocentric view of the world. I spent a few hours at the V&A and, dare I say, listened in to the conversations of the visitors. Some English visitors rejoiced at the thoughts of these items being in the care of British Museums where they could “be seen by everybody.” While I cannot certify that this opinion is representative of the country as a whole, I suspect most people share their views. I was tempted to engage and explain, that the accessibility of London is very relative if you examine it from a UK or European standpoint. London becomes virtually inaccessible if you are from Africa, or specifically Ethiopian and poor. Fundamentally, making London, the permanent home of another country’s historical library and heritage is an implicit assertion that London is still the center of the world and its museums are the sole appropriate custodians able to maintain and care for these century-old treasures. It is a de facto declaration of superiority. Museums have been to western countries what many large-scale portraits have been to their old monarchs: an artistic expression of status and power. These are the same power and status that Napoleon sought to express through the Louvres Museum in the 19th century. He rummaged through Europe plundering Spanish, Italian, and other countries’ museums to further endow the Parisian Museum that bore his name at the time. It is unfortunate that English lawmakers did not take inspiration from the Duke of Wellington, who upon defeating Napoleon in 1815, returned some of the objects held in the Louvres to their respective countries. (Some objects were removed from the Louvres and hidden away, thus preventing a full restitution). Even if the Duke of Wellington was attempting to erase traces of Napoleon’s hegemony in Europe, his gesture should have set a precedent for the restitution of items plundered in times of war. 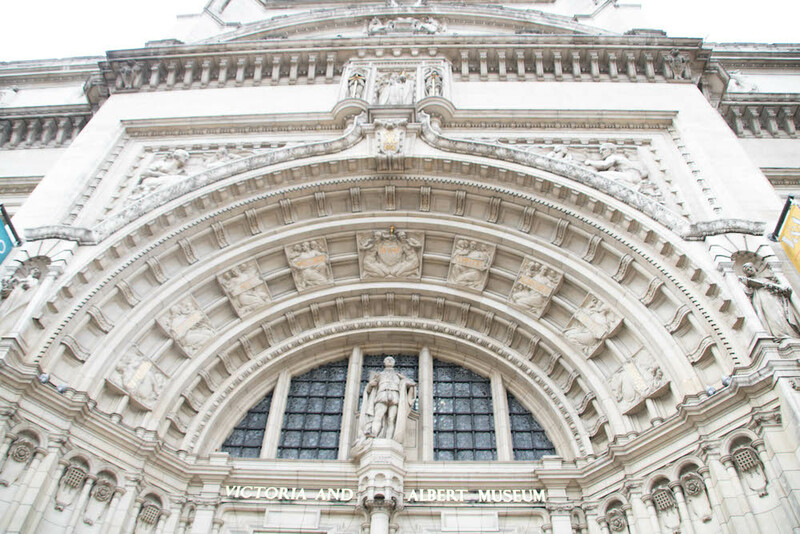 Instead, the parliament voted in favor of “purchasing” the treasures to enrich the collections of the South Kensington Museum (current day V&A). I never thought I would find in the V&A the most compelling reason why cultural treasures ought to be returned to their countries of origins, but I did. In expressing his reprobation at the appropriation of Abyssinian property, Mr. Gladstone added: Those articles, to us insignificant, [were] probably to the Abyssinians sacred and imposing symbols”. Beyond the legal arguments, there lies the most fundamental case for restitution. Most of these objects have meaning and intrinsic cultural value to the people they have been taken from. They carry their stories, their memories and remain an expression of their identity. But, so far western countries have given precedence to the intellectual curiosity of their scholars and visitors and their universalist view of their museums. That view is in itself an extended expression of colonialism and imperialism. Nearly sixty years after the independence of most African countries, and 150 years after the battle of Maqdala, it is time to challenge that view of the word. It is time to give hope to the Ethiopian children that one day, they will have access to their heritage without a need for a visa. It is time to look at Africa’s children and see in them the future legitimate and rightful custodians of their cultural properties. Most of all, I hope, the Ethiopian child I saw will not have to hunch over a glass cabinet in London in 50 years time, explaining to his incredulous children, just like his father did, why the golden crown can not just be taken away.